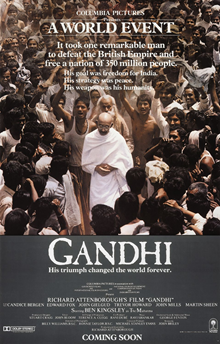 This epic movie presents Gandhi (Ben Kingsley) as a moral beacon in the darkness of colonialism, the simple voice of reason and integrity that falls on the deaf ears of a bunch of white guys in fussy uniforms whose civilized exterior belies their potential for cruelty due to a bloated sense of entitlement. While riding a train one day, Gandhi is thrown from the naivete of privilege into the dingy reality of prejudice and realizes he’s got to use his newly earned law degree to help his fellow Indians. Ovr the coruse of several decades, he manages to unite Hindus and Muslims against the tyranny of the British, whose façade of politeness is quickly shattered when their subjects stop bowing to them. One look at the British officers whacking he heads and shoulders of hundreds of quietly protesting Indian men in order to bully them into submission and it’s clear that maintaining oppression requires a high level of denial or the admission that shiny boots and clipped mustaches aside, you’re just another thug. Gandhi’s protests may have required more years and more bloodshed on his side’s part than he had hoped, and his coalition may have fallen apart quickly after his death, but his message of human dignity triumphing over the lust for power is enough to keep us hopeful even when it’s clear that yet another regime didn’t get the memo and the same old battles for human rights have to be fought all over again in some other corner of the world. If you’re feeling cynical, insignificant, and in need of some can-do spirit, check out Gandhi and see if it doesn’t get you off the couch and raring to make a difference in the world. When you’re feeling cynical and insignificant, watch Gandhi, a Power of One movie, for cinematherapy.